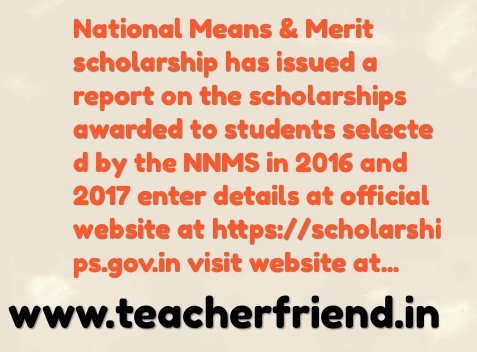 National Means & Merit scholarship has issued a report on the scholarships awarded to students selected by the NNMS in 2016 and 2017 enter details at official website at https://scholarships.gov.in/. November 2014 & 2015 & 2016 2017 National Scholarships Selected Candidates Issued by The Central Human Resources Department has issued a report on the scholarships awarded to students selected by the National Means & Merit scholarship in 2016 and 2017. National Scholarships Portal is one-stop solution through which various services starting from student application, application receipt, processing, sanction and disbursh of various scholarships to Students are enabled. This initiative aims at providing a Simplified, Mission-oriented,Accountable, Responsive & Transparent 'SMART' System for faster & effective disposal of Scholarships applications and delivery of funds directly into beneficiaries account without any leakages. Visit more information at official website Click Here.